Tuna is a classic in family recipes, from salads to pastas and everything in between. However, when it comes to Japenese cuisine, Southern Bluefin Tuna comes to life. Southern Bluefin Tuna is renowned and celebrated in the world of sashimi due to its rich colour and mouth-watering flavour. SBT’s prominent and irreplaceable role in Japanese cuisine makes Japan the industry’s single largest market. SBT can be sold fresh; however, it is most often sold frozen in three specialty cuts. The three premium cuts to this day carry their traditional Japanese names: otoro, chutoro and akami. Akami translates directly to “red meat”. It is derived from the top loin, shoulder and tail of the fish. Akami is less expensive than other parts of the fish because it is the most abundant. Akami with its vibrant colour and clean, bright flavour is the most common and frequently used part of the fish. Otoro translates to “big fat”. It is the fattiest part of the fish since it is derived from the fatty belly section. Otoro falls apart in the mouth and is full of umami. Its flavour profile and texture makes this cut the most desirable, and most expensive. Otoro sashimi: A marbled glistening ruby grapefruit colour. Odourless. Melt-in-mouth tenderness, slippery, gelatinous, a mouth-coating fattiness. Intense savoury flavours, some tartness, avocado nuttiness, fresh oyster and herbaceous. Lingering flavours. Chutoro translates to “medium fat”. It is derived from the area of the belly fillet behind the otoro. Chutoro is a perfect blend of akami and otoro where it provides both a meaty and fatty texture. Chutoro makes up only a small amount of the fish; thus, it requires a whole fish to make one chutoro sashimi. Chutoro sashimi: Bright, glistening, turkish delight appearance. Hint of clean ocean odour. Melt-in-mouth tender. Intense tartness, savoury and some fresh oyster flavours that persist. Akami is the brightest in colour, followed by otoro than chutoro. Sensory descriptions have been developed for a selection of key seafood species from Eyre Peninsula, Australia’s seafood frontier, including Southern Bluefin Tuna. The sensory vocabulary was derived from a flavour wheel specific to Eyre Peninsula Seafood. Visit www.seafoodfrontier.com.au for more descriptions of aroma, flavour, texture and appearance of seafood from the Eyre Peninsula. 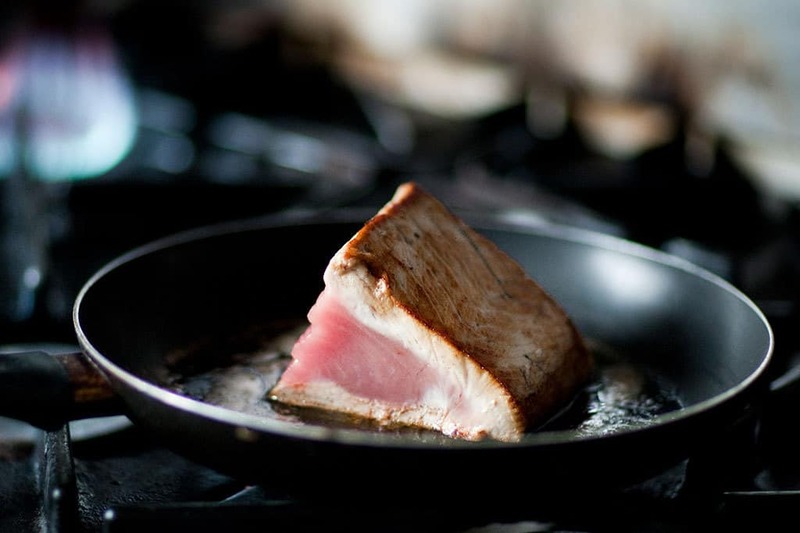 Check out some of these fantastic recipes using Southern Bluefin Tuna. Glistening turkish delight appearance. Intense caramelised white meat, some cooked broccoli notes. Extremely juicy and tender, a mouth-coating fattiness. Tart, savoury, sweet and salty, flavour of baked fresh white fish. Flavours persist.